Carpathian Forest formed out of the ashes of two bands: The Childmolesters and Enthrone, by Nattefrost (then bearing the pseudonym Lord Nosferatu) and Nordavind (who used the pseudonym Lord Karnstein). 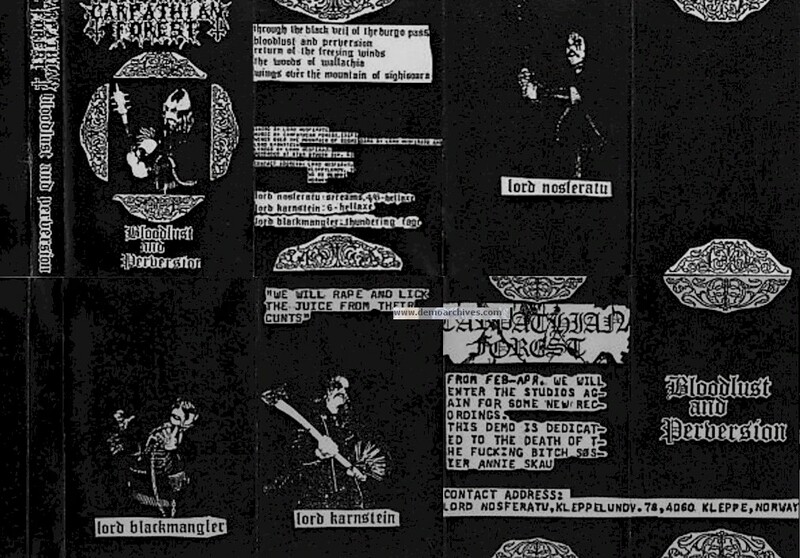 Enthrone changed its name to Carpathian Forest, and Lord Blackmangler and Damnatus joined their line-up. As a quartet they self-released three demo tapes: Rehearsal Outtake, Bloodlust and Perversion (both in 1992) and Journey Through the Cold Moors of Svarttjern (in 1993). However, Damnatus and Lord Blackmangler left afterwards, and Carpathian Forest became once more a duo.Carpathian Forest would release their first studio work in 1995: the extended play Through Chasm, Caves and Titan Woods, via Avantgarde Music. It would be their first of many releases via Avantgarde. In 1998 the band released their first full-length album, Black Shining Leather, once more via Avantgarde Music. Regular Xerox covers. Tapes varied..